A View of the Opera and Unter den Linden, Berlin, painted by Eduard Gaertner in 1845, is among the finest views of Berlin painted by the artist in the second phase of his artistic career. 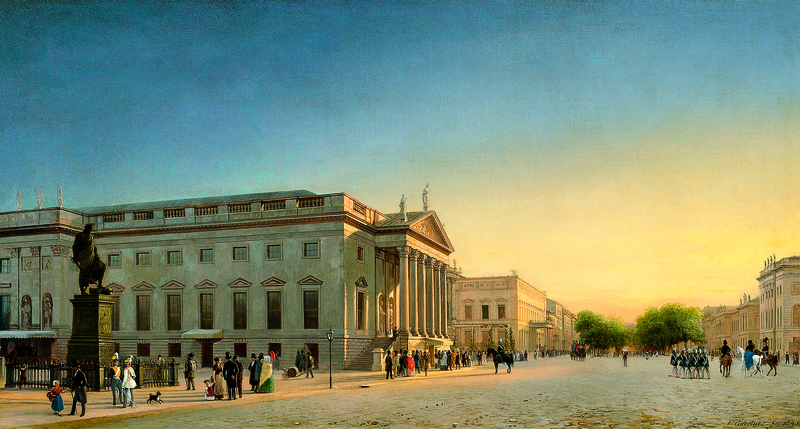 It shows the centre of the Prussian capital's spiritual and social life -the Opera (now the Staatsoper)- enveloped in the warm light of a late summer's evening. The theatre draws in the viewer's gaze with its imposing colonnade situated at the centre of the view. The Opera, designed by the architect Georg Wenzelhaus von Knobelsdorff, was built between 1741 and 1743. It was intended to mark the beginning of the Forum Fridericianum, a monumental complex planned by the King of Prussia, Frederick the Great, so as to be visible from his castle (by Andreas Schlüter). The Opera remains the only building erected according to this plan. The statue of General von Blücher rises up on the left. It was cast by the Berlin sculptor, Christian Daniel Rauch in 1826 and was initially placed in front of the gardens of the Prinzessinenpalais. Behind the Opera, a rigidly cubical building stands out: this is the town palace of Prince Henry, future Emperor William I, built by Carl Ferdinand Langhals between 1834 and 1837. At this spot the Unter den Linden boulevard, with the four rows of linden trees that give it its name, actually begins, leading to the Pariser Platz before the Brandenburg Gate. This splendid boulevard was lined with Berlin's finest private homes and cafés, and its most expensive shops. The buildings on right of the painting begin with the palace of Prince Henry, built by Johann Boumann, now belonging to Humboldt University with beyond it the outline of the former Academy of Art. The breadth of the luminous evening sky is ably paired with the wide paved surface in front of the Opera. This area, whose broad dimensions were aptly suited to the surrounding royal buildings, served both as a military parade ground and for civilian promenading. Eduard Gaertner is considered to be one of the most prominent artists of mid-century Berlin and the most important practitioner of architectural painting in Berlin -an art form with a peculiar history in that capital. Gaertner, like the majority of his colleagues, was first trained as a porcelain painter for the royal porcelain factory in Berlin (KPM). It is here that he realised how much King Frederick William III valued the views of his castles and of other royal buildings which he had painted on porcelain vases or services to be given to his most honoured guests on their official visits. After 1820, Gaertner became a set painter for the Gropius brothers who produced the sets designed by Karl Friedrich Schinkel. Starting in 1824-1825, Gaertner worked on his own and, in the course of the five subsequent decades, painted numerous views of the centre of Berlin, which had been considerably redesigned by Schinkel. Until the death of Frederick William III, his most important patron and protector, Gaertner´s views are characterised by their careful and precise descriptive intent. Buildings are painted under a bright light, and his works of Berlin, Moscow, and St. Petersburg all reveal judicious effects of light and shade. These views, still very modern to our eyes, form part of the history of the arts in Berlin in the first half of the 19th century which was dominated by architecture and sculpture. In 1840, Frederick William IV ascended to the throne of Prussia. More attracted to the idealist and Romantic movements than his predecessor, his artistic patronage gave a new direction to painting in Berlin, prompting a greater attention to colour and more dramatic lighting. From the 1840s onward this change is visible in Gaertner's own production, although he never abandoned his characteristic careful rendering of detail in his urban views. This painting is a good example of Gaertner's second period. His scrupulous and detached rendering of detail is blended with a more openly theatrical manner of composition in which he displays great sensibility to the play of light. As with many of his other works, this painting is linked to an important event: on the night of 18 to 19 November 1843, the Opera caught fire and burned down completely apart from the outer walls. Its reconstruction started almost immediately and it was reopened as early as December 1844. Gaertner masterfully sets the scene for the newly resplendent Opera house. The summer evening light imbues the grand view with warmth and serenity while this light also accentuates the monumentality of the rigid, rectangular structure of the Baroque edifice. The shading of colour -through which the underlying drawing emerges- imbues the painting with the pleasant transience of a summer's evening, its warm colours and crystal sky.